It can be a daunting task to sourcing a video display for an older Matsushita CNC machine tool. In some instances, even Matsushita may no longer support the particular CNC Machine or system you may have. Dynamic Displays, Inc. manufactures LCD retrofit Matsushita Monitors to replace the old CRT monitors in existing Matsushita equipment. 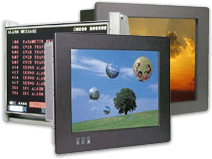 Dynamic Displays industrial LCD replacement monitors are designed specifically for and provide an alternate solution to old worn out CRTs and refurbished CRT replacements, which have a suspect life expectancy. Our LCD replacement solutions are brand new, in stock, provide a sharp clear image, are manufactured in the USA and carry a full year parts and labor warranty. If you have a need for a Matsushita monitor replacement please email or call us to find out more. Dynamic Displays, Inc. has been building LCD replacements for Matsushita CNC monitors since 1999. Our replacement LCD monitors are 100% electrically and mechanically compatible with older Matsushita CRT monitors. We are equipped and ready for overnight shipment of replacement LCDs for the following commonly requested Matsushita monitors: TX-901AB, TR-9DKYC, TX1204, TX-1204AC, TX1208AA, TX1404, TX-1404AB, TX-1424, TX-1424AB, TX-1450AB, TX-1450ABA, TX-1450AB5 and C-5470NS. If you have a Matsushita CRT model that is not listed above, our engineering staff will be happy to modify one of our standard models to meet the unique CNC monitor specifications required and extend the life of your production equipment. This is typically a quick process and results are guaranteed. Monitor replacements carry a two year parts and labor warranty and excellent customer support.